1. Get a cereal bowl and measure the dry ingredients into the bowl. Stir them around until you have an even brown/beige colour. 2. Add the milk and oil, and whisk everything together. 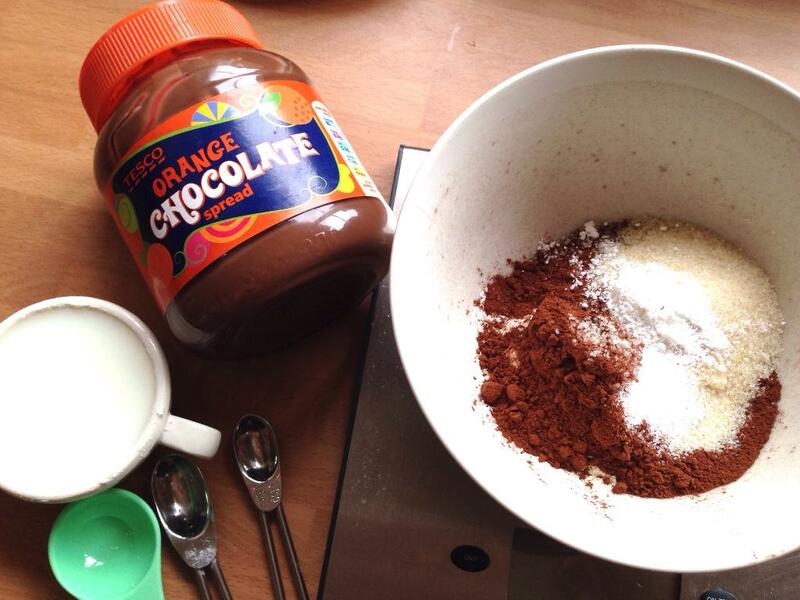 Grab a mug and pour your mix into it. 3. 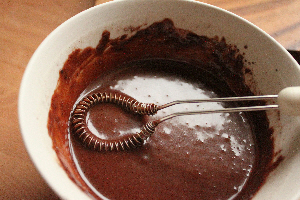 Dollop a spoonful of chocolate spread in the top centre of the mix–don’t push it down, just leave it. 4. Follow the cooking guidelines below. Microwaves vary greatly, even ones with the same wattage, and the size and shape of your mug can make a difference to how your cake comes out too. As a guideline though, if your cake is cooked in a regular-sized mug in an 850 watt microwave, it will take around 100 seconds. If you’re cooking it in a 950 watt microwave, then the time will be more like 70 seconds. If you have a chunkier, shallower mug then this will be less. If you cook your mug cake in two smaller mugs then the time will be less too. TIP: This makes a cake that’s quite large, even for an adult, so if you’re cooking this for kids I’d definitely recommend splitting the mixture into two smaller mugs, and adjust the timings as necessary. 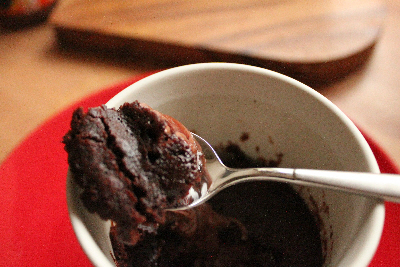 You can see by the chocolate trail on the inside of the mug, how high the cake rose during cooking–look how it fell. That’s because there was no egg in the mix. How does a cake work when it doesn’t have egg in it? Well, when we looked at the science of cakes before, we learned that one of the things a cake needed to rise was egg. The egg helps to form walls around the air bubbles and keep the bubbles in place, therefore it holds the cake up. Although the egg expands as the cake rises, it doesn’t actually cause the rise, it just holds the inside of the cake up. When we make a microwave cake, the cooking process is very quick. We also tend to eat the cake quickly too. So the cake can still rise without the egg, it just doesn’t stay as high once you take it out of the microwave. You’ll notice that the cake rises quite high in the mug when it’s in the microwave, but by the time you eat it, the cake has slumped a little. Some of the air is escaping as the egg isn’t there to hold it all up. 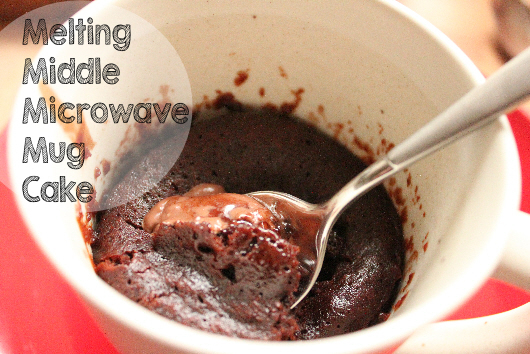 So a microwave cake without egg isn’t light, but it is nice and moist, which works well with a chocolate cake anyway. The things that make this cake rise are the gluten in the flour, and the baking powder that we add. Without these, we really wouldn’t have a very nice cake at all, and there would be no rise. It’s also interesting to note that our chocolate spread is held in the middle better as there aren’t as many air bubbles. If there were lots of air bubbles, the chocolate spread would sink through the bubbles and end up at the bottom of the mug. Does a plain flour mean whole wheat flour or self raising flour ? Hello, plain flour is neither of those things, it’s just plain flour. I believe some countries call it all-purpose flour. Hope this helps.